Summer is the perfect time of year to work on your home—you can open the windows to let the fresh air in as you repaint your walls, dust the shelves, remove old junk, bring in new furniture and change the décor. For many homeowners, summer is the best time to complete work in their kitchens too. Installing gorgeous new countertops, backsplash, redoing the floors, and replacing out old curtains, tablecloths, and mats are just a few kitchen home improvement jobs. If you’re ready to upgrade your kitchen cabinets, there are a few options available. You may choose to simply refinish your kitchen cabinets or reface them for a brand-new design. Whichever option you choose, here’s what you need to know about your options, and where you can get quality work done. If you want to improve the look of your kitchen cabinets, you can either replace them entirely or for a more cost-effective option you can upgrade them by painting or refinishing. Before getting into a complicated remodel project, here is what you need to know about refinishing and refacing. When you refinish your kitchen cabinets, you keep all components of your existing cabinetry and simply change the colour or the finish. This is typically done by cleaning and sanding to strip the existing finish from the wood. Once this is complete, new coat(s) of primer, paint or stain is applied, and your cabinets will look as good as new. When you work with a professional refinishing company, you can choose different colours to create surprising results, including two-tone painting for a more creative look. A professional refinishing job will last years and only take a few days to complete, so you will win big on your investment. Any nicked or worn out areas can be easily touched up to extend the life of the paint job as well. This process involves replacing the cabinet doors with new laminate or wood veneer replacement material. The cabinet frame and boxes remain the same, but all doors and drawer fronts are replaced with new components. The side panels, face frames, and moulding can also be replaced to make everything match. 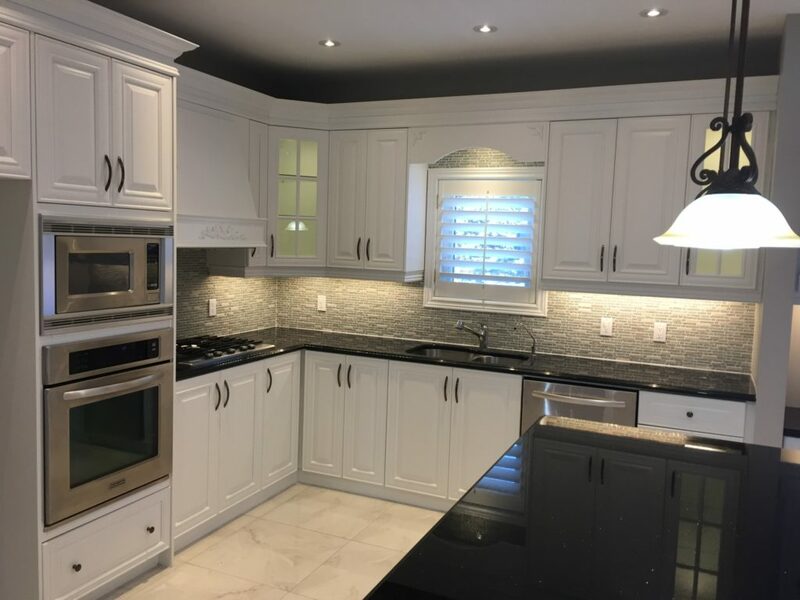 Refacing is done to cover up any blemishes or finish problems, and allows you to change the wood, colour, and especially style for a fresh and updated look. You can even add new decorative hardware or crown moulding. The term “refacing” is often used interchangeably with the term “resurfacing”, especially by cabinet makers and professional remodellers. Why Should You Refinish Your Kitchen Cabinets? Requires much less time and energy. Your kitchen makeover is only days away. Typically costs half as much as completely replacing your cabinets. Easier than completely replacing your cabinets. Allows you to keep your existing design but alterations can still be made. Better for the environment. Nothing is going to a landfill. When choosing between kitchen cabinet refinishing or refacing, there are a few things to consider. One of the major concerns for homeowners is their budget. Based on typical applications, refinishing cabinets costs about two-thirds of the cost of refacing, meanwhile refacing costs about 70% to 80% of the total amount it would cost to install brand new, replacement cabinets. Depending on the size of the job, type of stain, refinishing tactic, and cabinet design, refinishing generally costs between $200 and $3,000 for materials and $500 to $3,000 for labour. On average, homeowners generally spend about $2,400 in total. Refacing them would cost more—in many cases, double the amount of refinishing their cabinets. On average, the cost of refacing cabinets is around $6,300. If you’re ready to transform the look of your kitchen cabinets this summer, give the professionals at Booth7 a call. Skilled DIY homeowners may be tempted to refinish their own cabinets; however, it is a fairly involved process. By choosing a professional cabinet refinishing company, it will guarantee you a quality job. It may cost you upfront, but the savings you will get from a final product that stands the test of time is worth it. Experience with stripping, cosmetic repair, staining or painting is essential to a quality outcome, and professionals can get the job done right. At Booth7, our team offers high-quality, professional kitchen cabinet painting and refinishing services, and excellent customer service. We use only water-based, low VOC lacquer and solvents that are very consumer and household-friendly. Have small children or worried about lingering paint smell and breathing in hazardous paint fumes? Don’t be…with Booth7, you won’t have that problem. In fact, we’ve never had a single complaint about lingering paint smell during or after a refinishing project. We handle all the details of your project from start to finish, so you can trust you are in good hands! Give us a call today and we will return your call within a few hours. At Booth7, we are available seven days a week to answer all your inquiries. We service Toronto and the surrounding areas. If you require our assistance or want a free consultation and estimate, fill out our online form or contact us at info@booth7.com.